TMC AquaRay has finally granted the AquaBeam NUV 410nm LED to be released to the US market. The LED was released to Europe back in 2013 and only to the UK, for quantity control issues. The LED has the same design as the rest of the Solid State AquaRay line, with 5 SemiLED x 410nm near-ultra violet (NUV) didoes, 120 beam angle. It has the waterproof rating of IP67, no fan, shimmer, low carbon output/watts, PWM dimming, and the 5 year full replacement warranty. At this point of 2016, American Aquarium Products is the only full service authorized supplier of these LED to the Western hobbyist. The point of a emitter in this range is to enhance the colors of corals, fish, and plants. “This 410nm wavelength will make corals fluoresce (as well as some other critters and fish) and has been shown to improve the red pigment ratio of certain deep water coral species such as Lobophyllia and Trachyphyllia“. Since this lighting spectrum is in the far side of the lighting spectrum, which also dips into the UVB range, limited quantity/amounts of the light is suggested. TMC rates on strip of 5 emitters to light up to 170gals/650 litres, and is best seen when the tank is extra dark, say at night, when daytime lighting is off. The LEDs can be used during day lighting hours, just the recommendations of one strip per 170gals has to be considered for true coloration and amounts of UVB provided. There are other Ultra Violet LEDs out in other commercial fixtures to date, but nothing up to TMC standards of quality of build, and also as a stand alone fixture. Some marine fixtures do have a couple NUV emitters in their fixtures, but separate controllability is not an option, which is why a separate fixture is preferred. TMC does not give a rating on how long to run the fixture, say all the way threw the night, so caution is advised for health in mind. Start slow and work your way up and also know, limit amounts of this lighting type (more to the UVB range) actually reach the Earth surface. Watch your eyes, as it can be quick to try and blind you. UVB is harmful, so consider safety. The fixture could be considered for reptile use, but keep in mind, it has a purple/blue look and since this is a new technology, reptiles would really need to be watched as far as health, as no reptile UVB LEDs are on the market as of yet. Considering the amount of energy used by both fixtures, the NUV could be used as a supplement UVB light, to be ran all day during normal daylight hours for reptiles. For reef tanks, volume of water needs to be considered. The supplement light can be ran all day on 170 gals of water. AAP- An online aquarium & pond supply company, well known for their vast experience and research based information library. AMP – Ampere; is the SI unit of electric current. AC – Activated Carbon, a chemical filtration media. Acan – Acanthastrea, a genus of large stony coral. Acro – Acropora, a genus of small stony coral. ALK – Alkalinity, the measure of the alkaline buffering capacity of water. BBA – Black Beard Algae. BN – Bristle Nose Pleco, Ancistrus sp, a genus of plecos. BPS – Bubbles Per Second, used as a measure of the CO2 rate entering an aquarium by advanced planted aquarium keepers. Ca(OH)2 – Calcium Hydroxide, used to make Kalkwasser. CC – Crushed Coral, sized #2 through #5. CO2 – Carbon Dioxide, a colorless gas of one carbon and two oxygen atoms. Cu – Copper, a reddish metallic element. CUC – Clean Up Crew, critters that remove algae and detritus. Cyano – Cyanobacteria, commonly referred to as slime algae. DD – DownDraft, a type of protein skimmer. DI – De-ionized water, also known as distilled water depending upon method used to achieve the same results which is completely mieral and ion free water. GFCI – Ground Fault Circuit Interrupter, an AC plug designed to prevent electrical shock. GFO – Granular Ferric Oxide, a chemical filtration media generally used for phosphate & silicate removal. GH – General Hardness, a measure of calcium and magnesium. GHA – Green Hair Algae. GPD – Gallons Per Day, a measurement of flow. GPH – Gallons Per Hour, a measurement of flow. GPM – Gallons Per Minute, a measurement of flow. GSA – Green Spot Algae. HID – High Intensity Discharge lighting, metal halide and mercury vapor. HITH – Hole in the Head, a fish ailment, common with cichlids. HLLE – Head and Line Lateral Erosion, a fish ailment, more common in marine species. HOB – Hang On Back filter, also a term for a type of skimmer. HQI – Mercury (Hg) Quartz Iodide, a type of metal halide lamp. IR – Infrared, a type of light with a longer wave length than visible light. K – Kelvin rating, color temperature of the light source. KALK or KW- Kalkwasser, German for calcium hydroxide solution or limewater. KH – Carbonate Hardness, a measure of carbonates. KMnO4 – Chemical formula for potassium permanganate. lm – Lumen, the unit for amount of light from a light source. LPD – Liter Per Day, a measurement of flow (metric). LPH – Litre Per Hour, a measurement of flow (metric). LPM – Liters Per Minute, a measurement of flow (metric). LPS – Large Polyped Scleractinian, a stony coral, has large and soft polyps. LR – Live Rock, rock with living organisms including nitrifying and de-nitrifying bacteria within it. LS – Live Sand, sand with living organisms including nitrifying and de-nitrifying bacteria within it. Lx or Lux – the amount of light per square meter (lm/m2). MCF – Midwest Coral Farms, a well known coral farm in the Chicago area. MEQ/L – Milli-Equivalents per Liter, a measure of alkalinity. Mg – Magnesium, a trace mineral. mg/L – Milligrams Per Liter, 1 mg/L = 1 ppm (parts per million). MH – Metal Halide light. NH3 – Ammonia, a compound of nitrogen and hydrogen. NH4 – Ammonium, a compound of nitrogen and hydrogen. nm – NanoMeter, commonly used as a unit for wavelength(color) of light. NO2 – Nitrite, a product of ammonia oxidation. NO3 – Nitrate, a result of nitrites converted by Nitrobacter bacteria. ORP – Oxidation Reduction Potential, more correctly now known as Redox balance which is the blance of both Oxidation AND Reduction, both proven to be essential for life, including aquatic. PAS – photosynthetic action spectrum, another term for PUR. PAMR – Professional Aquarium Maintenance & Research. An abbreviation or credential applied to persons with years of experience in professional aquarium/pond keeping and research, as opposed to the many posers lurking in Facebook groups and Yahoo Answers. PAR – Photosynthetically Active Radiation. pH – Potential Hydrogen, a measure of the acidity or alkalinity of a solution. PP – Potassium Permanganate, a chemical used in fish baths & swab as well as used to kill snails, snail eggs, and some parasites. PVC – Poly Vinyl Chloride, used for piping and plumbing. PUR – Photosynthetically Usable Radiation, another term for photosynthetic action spectrum. QM – Quality Marine USA, generally regarded as the premier seller of wholesale marine livestock, and now freshwater too. RO – Reverse Osmosis, a type of water purification that removes most contaminants & minerals, but leaves some ions. RMA – Return Merchandise Authorization. Many larger aquarium/pond supply retailers requires these be filed before returning defective, damaged, or simply unwanted merchandise. This is often a way to lower return numbers in the same way companies know that many rebate offers are not returned. I suggest to look for online businesses that do NOT require RMAs! RTN – Rapid Tissue Necrosis, protozoal infection of corals; can be rapidly fatal if not treated. SG – Specific Gravity, a measurement of saltwater density, generally the most simple measurement of the amount of salt in a marine aquarium, although not as accurate as an Aquarium Refractometer. SPS – Small Polyped Scleractinian, stony corals with very small polyps. Sr – Strontium, an alkaline earth metal. STN – Sudden Tissue Necrosis, protozoal infection of corals; can be rapidly fatal if not treated. TDS – Total Dissolved Solids, the portion of solids in water that can pass through a 2 micron filter. TFC – Thin Film Composite, a type of RO membrane. UV – Ultra Violet, a spectrum of light. Commonly the UVC Spectrum is used for aquarium or pond sterilization and clarification as well as improved Redox balance by better UV Sterilizers generally found at higher end retailers. VHO -Very High Output, a type of fluorescent light. W/D or WD- Wet-dry, a method of aquarium filtration that is excellent at ammonia/nitrite removal, but also often results in high nitrates. Often used in the wrong aquarium applications and is often incorrectly recommended, especially for planted aquariums. WPG – Watts Per Gallon, a generally outdated method of measuring light requirements, however it is still useful when comparing apples to apples. ZC – Zoanthid Coral, a family of corals. These patented AAP Hydro Sponge Filters have as much as 5 times the capacity of comparable sized discount Sponge Filters (including Tetra) and are even higher capacity than the Swiss Tropical Sponge Filters. TMC has released their newest high end offering of LED Lighting. The picture to the left demonstrates the difference between the 2012 Reef White 1000 and the new Reef White 2000. This Reef White 2000 borrows much from the Ocean Blue NP 1500 in that it uses the same exact emitters with one important difference. These emitters are lensed which make them focused for more depth penetration. This is kept from the 1000 series tiles which the 2000 series is set to replace. The 1500 series are meant to have a wider footprint of 24 inches by 24 inches from an 8 x 8 tile. The 2000s project a 18″ x 18″ light footprint from a standard/common mounting height of about 6 to 8 inches above the water. As before with the 1000 series and this Reef White NP 2000, it’s the better choice for for a deeper aquarium over the Ocean Blue NP 1500. As a generalization, the Ocean Blue NP 1500 would be the choice for wide light spread or an aquarium under 20 inches. 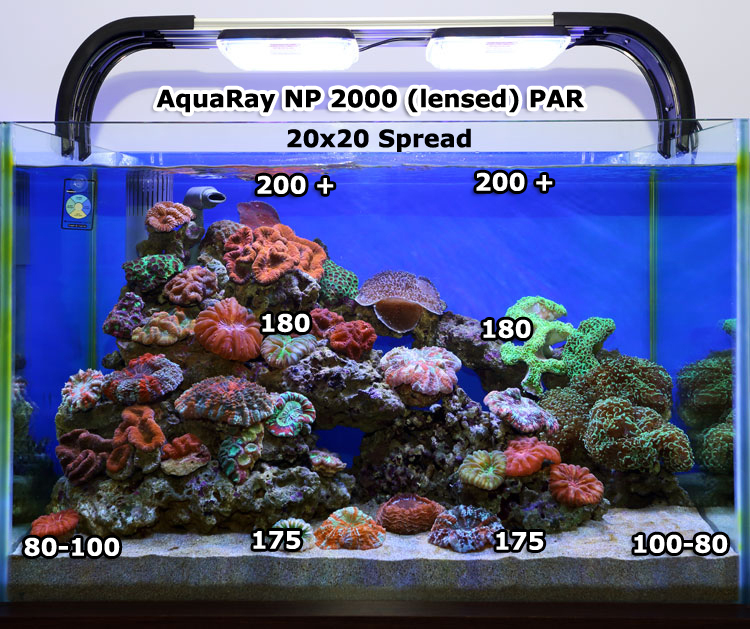 The Reef White NP 2000 would be suggested for any depth where very concentrated light is needed, such as a high light requiring sps coral or in a general reef aquarium from 20 to 30 inches or even much deeper with correct specimen placement. To the left is the Osram Oslon “Nature Perfect” blue reef emitter spectrograph. One important feature the 2000 borrows from the 1500 Ocean Blue is the Osram Oslon NP Blue emitters. These are the first emitters developed specifically for the use in Reef aquariums which provide the best over all PUR for your reef inhabitants. Early results also have shown less undesirable algae growth with the use of the Osram Oslon NP Blue emitters too. It’s important that I noted PUR and not PAR as PUR is the photosynthetically useful radiation (useful light) versus PAR which can still have plenty of useless light energy, especially if yellow, green, or warm white emitters are used (& to a lessor degree, cool white emitters). This is common with most aquarium LED fixtures since while they utilize Cree and other quality emitters, these are still from common general emitter bins that are not specifically designed for aquarium use. In fact aquarium use is but a minor use of these emitter bins and why multiple color emitters are required in a shotgun approach to achieve a good color balance. This results in wasted light energy in nanometers that are not of optimum PUR. 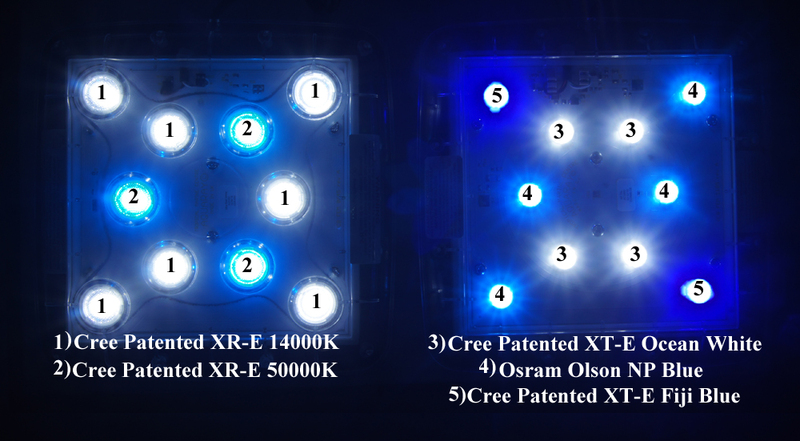 This is the case in some of the more popular but often over rated LEDs on the market. * SB Reef Light PRO 32. This is rated at 363 watts input energy with a PAR of approximately 881 (100%) at 400mm of air. * Kessil A150. This is rated at 90 watts input energy with a PAR of approximately 325 (100%) at 400mm of air. * AquaRay Reef White NP 2000. This is rated at 30 watts input energy with a PAR of 380 at 400mm of air. * Finnex Planted 24/7 20 inch model. This is rated at 15 watts input energy with a PAR of 61 at 400mm of air. What TMC also now doing as far as construction of their LEDs is standardization of lighting types and dropping a few less popular lights such as the Marine White 1000. TMC’s reason stated by people I know in the industry, is lower prices while still maintaining the quality of the world leader in LED aquarium lights. As well, TMC is continuing to utilize the best possible drivers and PWM (“pulse width modulation”) technology which is superior to “current reduction” which most all other LED controllers use. With PWM, there is NO change to the spectral output when changing voltage either up or down (dimming or ramping up your LEDs). Please note that these specs are preliminary. As of the time of posting this article, I will update this article should there be any more changes. Professionals say you only need 150 PAR with high PUR LED lighting. Keep clams, grow sticks, SPS… Grow anything you want! Plug and play right out of the box with no adjustments. PAR ratings were taken from Pacific Northwest Marine Aquarium Society Forum (PNWMAS) official PAR tool. The purpose of this hobbyist driven with expert input weblog is to provide the reader with Reviews, the best/highlights of aquarium and pond care/information articles, expand on existing articles (such as LED Lights, Lighting), or provide new articles based on popular content (such as Lighting). This site will continue to revise existing articles and slowly add new articles/ reviews over time as I honor both other's research AND experience. Note to readers; I certainly link to my favorite & sponsored websites. If I know the integrity, trust the articles, research, and information there in, it would be silly not to!! If you found a doctor, designer, or any other professional whom really knows their stuff, are you not going to shout them out?? This includes a mentor here in So. Oregon that I have worked with and has amazed me with his experience and knowledge.